the french foreign legion opens its extremely well secured gates for a handful of selected civilians. You are looking for the special challenge? 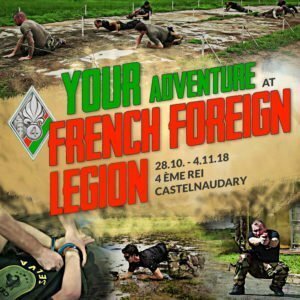 Then travel with us to the south of France in the Training Regiment of the French Foreign Legion, where you can be there at the military Krav Maga instructor course as a CIVILIAN for the first time. Those who want to become a Legion professionally have to undergo tough tests and only one in ten is even accepted. As part of the Military Instructor Courses, your greatest adventure will take place: 28.10. – 04.11.2018 in 4 REI – 4ème R.E. “Régiment d’Instruction de la Légion Étrangère held in Castelnaudary. So far, access is restricted to Legionnaires of the Foreign Legion and, if at all, soldiers of NATO countries. But now you have the unique opportunity to attend the Military Krav Maga Instructor Course at the Foreign Legion and train with us and the soldiers – even if you are NOT a soldier or an instructor. For the soldiers and Krav Maga instructors, the course is associated with a certification and extremely hard training as well as an extremely tough final exam. YOU can participate in most of this exclusive training (Shooting Range excluded) together with the Legionnaires. As a civilian, you will not receive a trainer’s certificate, but an exclusive certificate that you can proudly present! It would be a lie if we told you now that this Krav Maga course will not be hard, because he will … but unlike the professional participants, you can “catch your breath” when you can not ;-)! Are you crazy enough and want to participate in this unique adventure?